Gear up for the spring season with Franklin. Find a home-run selection of batting gloves, bags, training equipment and more that will have you feeling ready for the first pitch. The start of baseball season means it’s time to stock up at major league savings. Score top-brand bats, mitts, training gear & all you need to play better in 2019, right off the bat. Whether your kids are playing Little League or you've signed up for your company's corporate team, America's pastime is fun for all ages. It's especially fun if you show up for your game well-prepared. You bring the skills, and we'll help you select the best equipment — always at Every Day Low Prices. When you're ready to make a purchase, you'll find all the best baseball gear from top brands like Rawlings, Easton, Mizuno, Wilson, SKLZ, Louisville Slugger, Demarini and Franklin. You can't swing for the fences without a good bat that fits your body and style. We offer a variety of brands and sizes for both youth and adult players, so it's important to know what the numbers mean. Most bats measure between 24 and 34 inches, with kids between 5 and 10 years old using 24 through 29 inches and kids and adults 11 and older using 30 through 34 inches. One way to help determine the size you'll need is to hold your arm out to the side and measure the length between your chest and your index finger. The longer the span, the longer the bat you'll want to buy. Of course, there are exceptions to these rules, so if you can, practice swinging bats of different sizes before you shop. In addition to the length of the bat, you'll want to consider the weight drop. This is the length of the bat minus the number of ounces it weighs. For example, a bat that measures 34 inches and weighs 24 ounces has a weight drop of -10. Most bats have a weight drop between -3 and -12.5. Check with your league to find out if it puts a limit on weight drop. Most of the time, the older and more experienced the player, the higher the weight drop should be for the bat he or she uses during the game. If you're shopping for baseballs, you'll typically find that they're available in leather and synthetic materials, such as rubber. Leather is durable, lasts longer and is easy to hold on to, which makes it ideal for beginning pitchers. Rubber, which is often used for practice, is cheaper and stays cleaner when it rolls around in the dirt. Again, check with your league before you shop for one or the other, particularly if you're shopping for your team. Some organizations require balls made from certain materials or balls of certain weights or sizes. No matter the type of ball you use, you're going to need a glove to catch it. Consider the variety of sizes, colors, brands and styles. Gloves typically range from 8.5 to 13 inches, and the age of the player and his or her position will help determine what you need. For example, first basemen and outfielders typically need a slightly larger glove than the other infielders. Whether you're left or right-handed will also help determine the glove you choose. The glove should fit snugly. It should be stiff enough so the ball doesn't slide out but flexible enough that you can move the ball quickly. You know the old saying that practice makes perfect. Stock up on training gear to use at home or during official team practices. 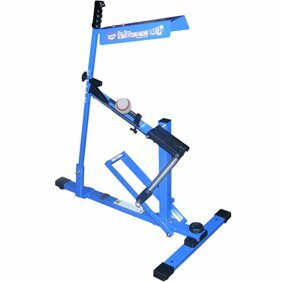 Our pitching machines, tees, nets and swing trainers are perfect for the slugger who wants perfect his or her swing. Our selection of nets, radars and baseball bags is ideal for any pitcher who wants to improve his or her fastball. Finally, you'll want to look the part. Your uniform can include both style and everything you need to keep your body safe during the big game. If your team doesn't already provide it or you just need something to wear for practice, pick your favorite baseball uniform pants, shirts, jerseys, socks and belts. Finish it off with the right pair of cleats for your age, ability and league regulations. When it comes to protection, start with batting gloves. Not only do they help you grip the bat, but they can protect you from the elements, mask old hand injuries and prevent blisters. A batting helmet is a must for protecting your head from speedy pitches, and guys almost always want to wear a cup and jockstrap. Compression shorts, catchers' masks, knee pads, face marks, mouth guards and shin guards can also help keep you safe and healthy while you're having fun. Shop for these items and more. Save Money. Live Better.